Smooth Sailing: Are you using The Web or The Internet? Are you using The Web or The Internet? If you are using The Web then you are also using The Internet but if you are using The Internet you may not be using The Web. People often use the the two terms interchangeably but at Spiral it's important we define the two terms correctly so we can focus our services where our expertise lies - on The Web. So what's the difference? USENET - distributed discussion system. Often used for news servers. SMTP - Simple Mail Transfer Protocol. For delivering mail. POP - Post Office Protocol. For retrieving mail. IMAP - Internet Message Access Protocol. For accessing email from multiple devices. The architecture and design of the Internet was conceived in 1973. Email predates the Internet, it started in 1965 as a way for multiple users on a computer to communicate. In 1983 the Internet proper was born when the global network switched to using TCP/IP for communications (still in place today) and the University of Wisconsin created the Domain Name System (DNS). The World Wide Web was released in 1992. The World Wide Web (WWW) is a way of accessing information across the Internet. A turning point for The Web was the release of the Mosaic web browser in 1993, making it easier for regular folk to use the web. 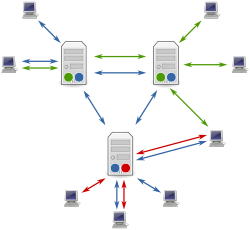 The Web uses the HTTP protocol to share information over the Internet. You use your web browser (Internet Explorer, Firefox, Safari etc) to access web pages that are linked to each other via hyperlinks. Those pages may also contain text, images, video, sound etc. Queen Elizabeth II sent her first email in 1976. How to look like an amateur - is this you?